33 avenue blogger Cameron Miquelon conducted the following experiment: Counting the number of ad pages in U.S. Vogue's September Issue. Guess how many of the 758 (!) pages are actually ads, before clicking. 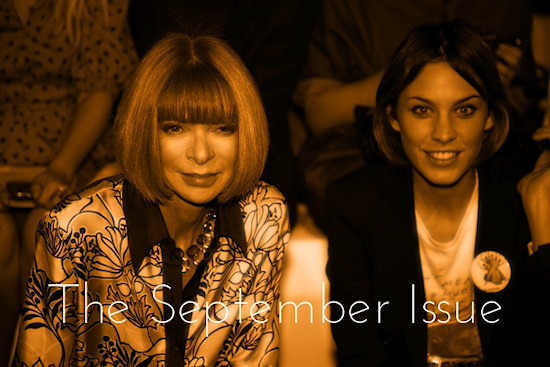 Hi, September is approaching and with it the "big glossy" launches its most important issue: The September Issue, which – I have the feeling – boosts its number of pages every year. In 2011 the telephone book-sized magazine reaches 758 pages! But how many of them are real content? Cameron Miquelon conducted the following experiment and counted the number of ad pages vs. editorial content. The result: 527 pages are advertisements, the rest: table of contents, imprint, editorial photo series and some articles and interviews. Would you pay for a magazine that consists primarily of advertisements? So is this a sustainable business model considering you can watch all the ad campaigns on the Internet for free? Do not understand me wrong, I like to skim through the ad pages from time to time, but I am wondering how much value this practice really adds to the magazine in the times of blogs & Co.
You probably already knew that ;) Designer Purushu reminds us about the not so glamours side of being a model. Considering a whole armada of models on sites such as modelmayhem or model-kartei, who are willing to do almost any kind of shooting for free, the times for models are unfortunately not so good any more. We all love make-up and it is awesome, but when it becomes a pressure it is not. Just a very important reminder from Those Graces how pretty you are with no make-up! Knock, knock, Who’s there? It’s me September! The month you learn to love and hate ... But love more. How can I top last September? It’s a month for makeovers! Now before you go grab your friends and have a scene straight out of Clueless, let me clarify what I mean by makeover. I don’t expect you to be only concerned about what you’re wearing but EVERYTHING! I believe September is a great month for change. Refresh your wardrobe, change your writing style up a bit, find different angles to cover shows, go back and look at last September and figure out how to spice things up this year, perhaps it’s time to refresh your gadgets?, change your make-up palette, read new content, simply explore! Change is usually a good thing. Top 5 Retailer Magazines: Where you can get the best editorial for FREE! Vivienne Westwood and Photographer Jurgen Teller campaign for a Better World. Work from home? Blogging it’s totally not. What's Her Face, Dolores Haze: the Humbert Humbert in All of Us.